PA advisor insists that negotiations cannot continue unless Israel changes current coalition gov't - and demands that it does. Nimer Hamed, the political advisor to Palestinian Authority (PA) Chairman Mahmoud Abbas, has expressed optimism in the success of peace talks - but only in the event that the PA and Israel can agree on matters related to security, including the crucial Jordan Valley region. According to Reshet Bet, Hamed also claims that the PA cannot move forward with negotiations unless Prime Minister Binyamin Netanyahu changes the current coalition government. Hamed added that the PA expects "concrete steps" from Israel following meetings with US Secretary of State John Kerry - but the PA refuses to give any details about what those steps may entail. Justice Minister Tzipi Livni, who facilitated the talks, stated recently that the current coalition government has made negotiations with the PA difficult. She has been allegedly championing for the Labor party to join the government from the Opposition in a bid for the talks to move forward. "There is now an opportunity and a political process [with the Palestinian Authority], and therefore we cannot just address the need for a peace deal; Labor must enter the government in order to help the talks progress," Livni stated, at a party throw by Labor and HaTnua party members in honor of Nesher mayor Avi Binamo. Livni continued, "If in the past, we didn't have a chance or inclination to enter into the government, we need to take the chance now - to stop the coalition Yesh Atid imposed by adding Jewish Home to the government." The chance of change seems scarce, however; Labor party head and Opposition leader Shelly Yachimovich has already refused to join the coalition. "Livni’s call is coming out of political distress, and is not a call for peace," she responded. 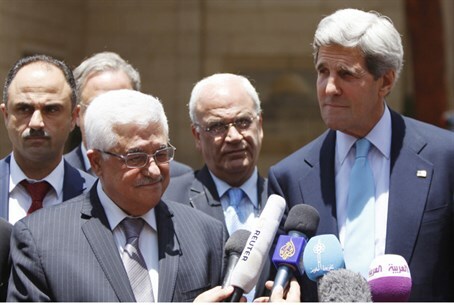 It is unclear what the future of the peace process will be, as PA negotiators have reportedly pulled out of future talks. Meanwhile, Israel's relationship with the US, and particularly US Secretary of State John Kerry, has been rapidly deteriorating over Kerry's inflammatory remarks during his Israel visit.